It’s an event 65 million years in the making…From Boxing Day, Adelaide Zoo is travelling back in time to when dinosaurs roamed the earth. These school holidays, take a prehistoric journey into the Jurassic realm and meet our newest but most ancient residents. Dinosaurs Alive will give budding paleontologists the opportunity to walk alongside seven life-size and life-like roaring, snarling and moving animatronic dinosaurs. Ever wanted to measure up to a T. Rex, come face-to-face with a Spinosauras or take a selfie with an Apatosaurus? Learn about these fascinating and gigantic creatures and their similarities to some of your favourite zoo residents. Plus, there are lots of new members to the wild family waiting to meet you, including the adorable baby Hamadryas Baboon and tiny Golden Lion Tamarin youngster. With all of this fun included in the price of a general admission ticket or membership, there’s no better time to visit Adelaide Zoo. Round up your little paleontologists to meet the dinosaur friends, along with all of your favourite zoo residents. Don’t miss this dino-mite immersive experience! There’s even more packed in to both Adelaide and Monarto Zoo’s fun-filled schedules over the school break to keep little and big people alike busy, with free Meet the Keeper presentations and some great prizes up for grabs. Adelaide Zoo’s vacation care program, ZOOcation, is also in full swing, giving kids an opportunity to spend the day at the zoo visiting all their favourite animal friends under the care of qualified conservation educators. The dinosaurs are on display from Monday, 26 December to Sunday, 6 February so make sure you stomp your way in to Adelaide Zoo before they go extinct…again! 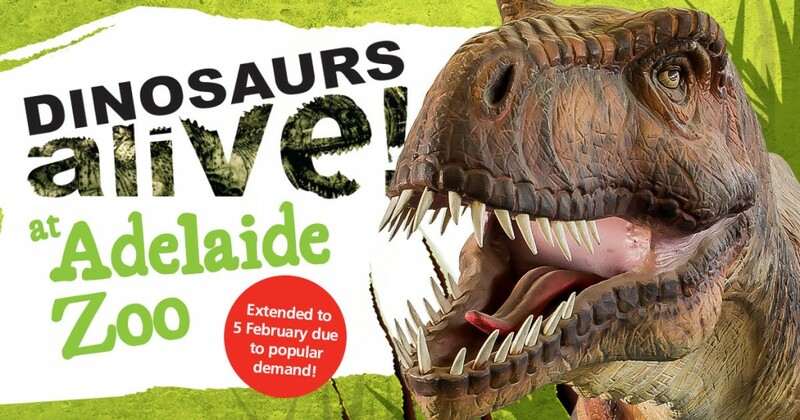 For more information on Dinosaurs Alive or the school holiday program, please visit the Adelaide Zoo website.